Amazingly, my 1972 Porsche 911 has been chosen to be included in the storyline display at the annual Luftgekühlt event in May. This year it’s being held at the famous backlot of Universal Studios. It still hasn’t sunk in how really lucky I am to be included. 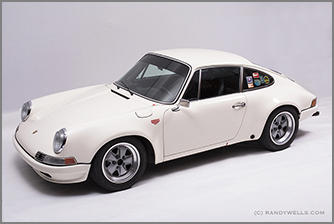 It’s just an R Gruppe club car really – not concours or even close. It’s a modded ’72 T that I happened to develop starting in 1998 for a specific purpose and then use for that purpose over the next dozen years. It’s probably more arbitrary than anything else that it’s part of a club that later limited its membership to 300. I kind of look at its inclusion in Luft 6 in the same way, although knowing Patrick Long and Jeff Zwart I’m sure there was a reasoned approach. It must have been next to impossible task to pick the display cars with so many great ones to choose from.